Hey all! I showed a preview of this shoot two weeks ago on my Instagram page because I suddenly started doing ballet in the woods and couldn't wait to share something with you all! 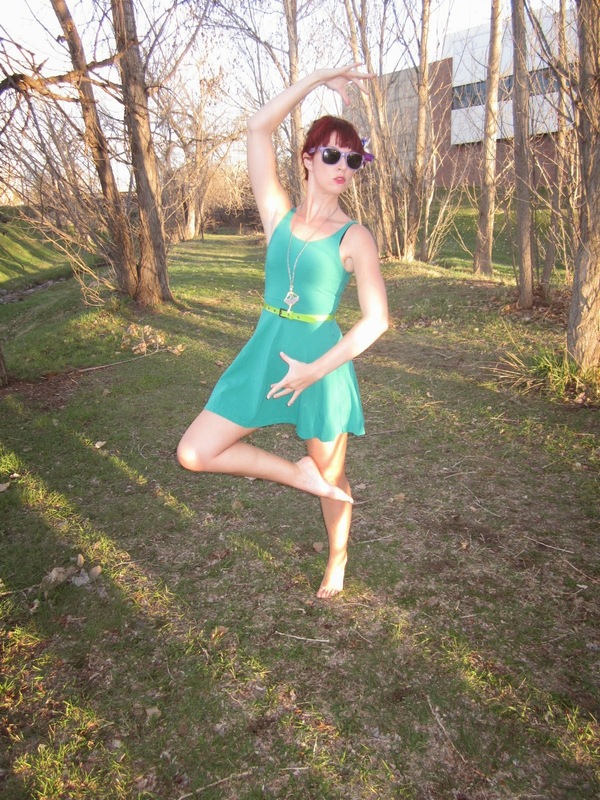 I was wearing a vintage necklace of a ballerina figure, so maybe somehow that had an effect on me! Anyway, originally this was a two in one special pieces Saturday in that I love the skater dress and the blazer but now it's going to be a two piece showcase plus some ballet photos! Hope you enjoy! And please don't judge the ballet photos too much-I am MANY years out of practice! I recently got this jacket on sale at ModCloth. I actually have a fairly impressive jacket collection but for whatever reason I showcased cardigans more on the blog and Instagram this past winter. (Mental note for the fall: wear your jackets more in photos, Blair!) I don't own many patterned jackets and I thought this print was so pretty. I could see it as an amazing staple piece for late spring and early fall because in Colorado it can be 80-100 degrees during those seasons but without the sun at night it gets really chilly. I may very well actually wear a shorter skirt or dress during the day that is a solid color, but will need something to dress it up a bit for at night. Given that it was on sale, purchasing this jacket was a no brainer! And I'm really glad I did! This dress from Express is also special because it was one of the first pieces I bought that was "out of my norm." I hadn't been into higher waisted clothing (see photos below for full effect) and this dress served as a gateway drug to experimenting with more "demure" looks that led me to dressing the way I do now. 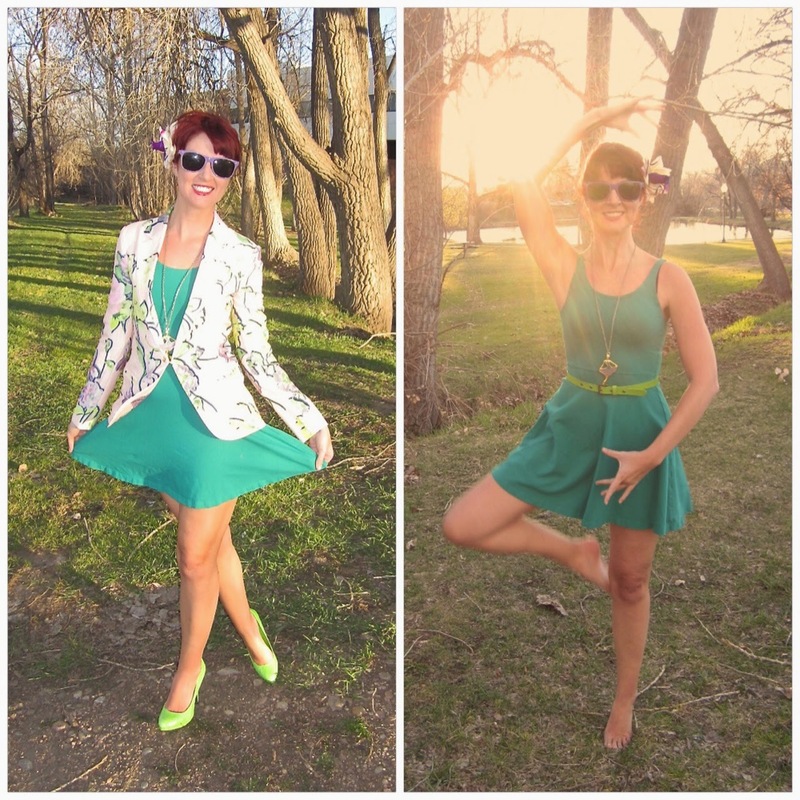 I had no idea that when I'd be searching for a dress for a St Patrick's day outing a few years back that I would be actually taking the first steps towards revamping my whole closet! 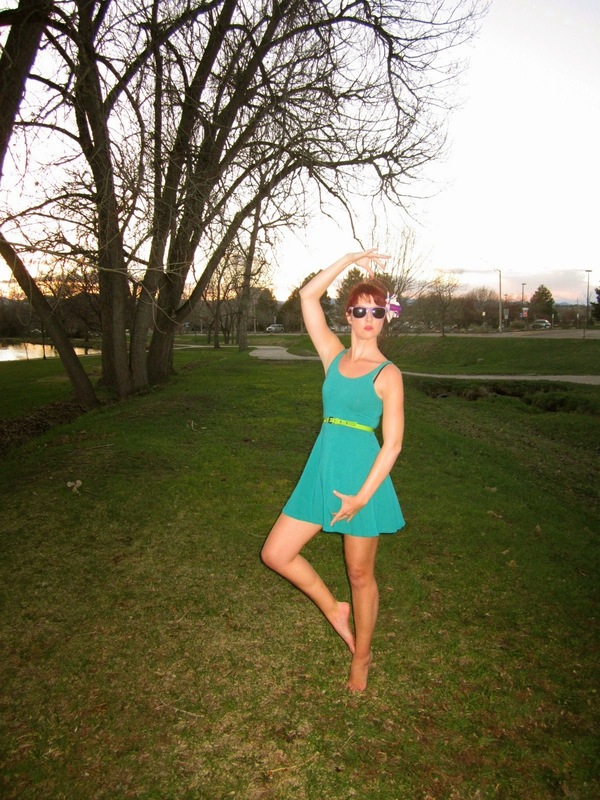 For whatever reason, I started posing like a ballerina and things kind of snowballed from there! 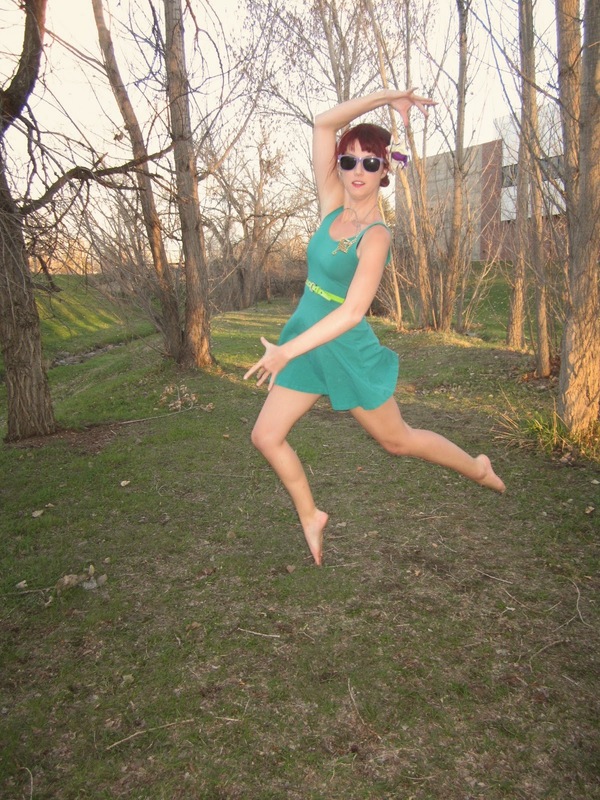 I took off my jacket to better show off my form and switched my hair flower to the opposite side because my stronger side was hiding the flower in photos, and suddenly I was back in Pennsylvania, in my youth, in the woods, a ballet student trying to perfect her jumps, and being totally young at heart. If you are a trained ballet dancer, I'm sure you can spot some rusty forms. But hey, I can still get some major height!! Let me leave you with my favorite photo (below) from this whole photographic experiment. The reason why it's my favorite are a few reasons: 1) I like the composition, 2) I nailed the ballet fingers, 3) you can really see my muscles popping in this jump. The muscle thing is sensitive for me because when I was a teenager I had these awesome curves in my legs from years of ballet. Over the past few years I've been through hell medically and my weight has fluctuated. Around last spring I noticed that in my outfit photos that it felt like my legs were twigs-something that regardless of my weight in the past was never the case. It felt weird. These photos prove that I still have that definition and haven't disappeared as much as I thought I had. I could keep going, but my point in all of this is that everyone has body insecurities regardless of where on the size spectrum they are. But we all have to find something that we love about ourselves. And if you are unhappy (at either side of the spectrum) with your body, do something healthy instead of dieting binging or other unhealthy means of changing your body. What great photos...looks so fun! I always thought you had the figure of a ballet dancer! By the way who takes your photos for you blog/instagram?